Planning a visit to Cambridge, MA, in the coming weeks? If so, be sure to check out an exhibition at Harvard’s Houghton Library addressing the very hot topics of immigration, DACA, asylum, and travel bans. Passports: Lives in Transit is in its final weeks, and library curators are inviting the public to examine passports, visas, and travel documents hailing from Harvard Library collections, as well as an installation of expired passports. Featured famous migrants include Leon Trotsky, George Balanchine, and others. From 5:30pm to 7pm, visitors are invited to the Mama Africa Party in the Houghton Library’s Edison and Newman room. Billed as a “cross cultural celebration of humanity’s common roots,” live music will be performed by Afro-pop musician Albino Mbie, dancing performed by Angie Egea, and food provided by Suya Joint All African Cuisine. Albino Mbie/Courtesy of Shuhei Teshima. 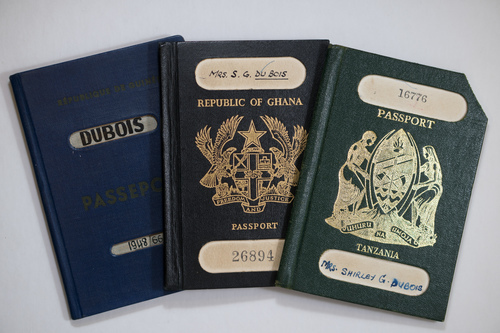 Shirley Graham Du Bois’ African Passports: Ghana, 1963 and Tanzania, 1972. Schlesinger Library, Radcliffe Institute, Papers of Shirley Graham Du Bois, 1865-1998, MC 476. Planning a visit to Cambridge, MA, in the coming weeks? If so, be sure to check out an exhibition at Harvard's Houghton Library addressing the very hot topics of immigration, DACA, asylum, and travel bans. Passports: Lives in Transit is in its final weeks, and library curators are inviting the public to examine passports, visas, and travel documents hailing from Harvard Library collections, as well as an installation of expired passports. Featured famous migrants include Leon Trotsky, George Balanchine, and others. On August 10, the library is hosting a closing celebration from 4:30pm to 7pm. First up is a panel discussion and Q & A with speakers from Harvard's Administrative Fellowship Program. Hosted by Anne-Marie Eze, Houghton's director of scholarly and public programs, panel participants will discuss "Global Mobility: Identity, Migration, and Passports." From 5:30pm to 7pm, visitors are invited to the Mama Africa Party in the Houghton Library's Edison and Newman room. 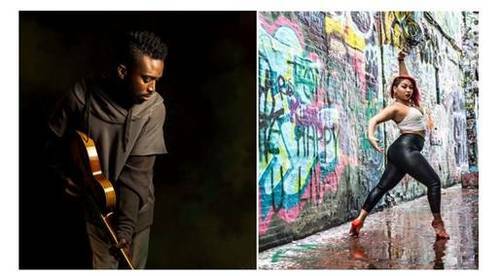 Billed as a "cross cultural celebration of humanity's common roots," live music will be performed by Afro-pop musician Albino Mbie, dancing performed by Angie Egea, and food provided by Suya Joint All African Cuisine. Shirley Graham Du Bois' African Passports: Ghana, 1963 and Tanzania, 1972. Schlesinger Library, Radcliffe Institute, Papers of Shirley Graham Du Bois, 1865-1998, MC 476.